It is appropriate that Mitch Duneier begins Slim’s Table: Race, Respectability, and Masculinity with a race story and that Ovie Carter’s photograph of Bart accompanies the opening chapter. For a generation who came of age when race was literally written on the landscape and was the blueprint for organizing civic relations, examining how a black man and a white man lived beyond those plans in late twentieth century Chicago becomes worthwhile. Ovie Carter photograph of Bart. 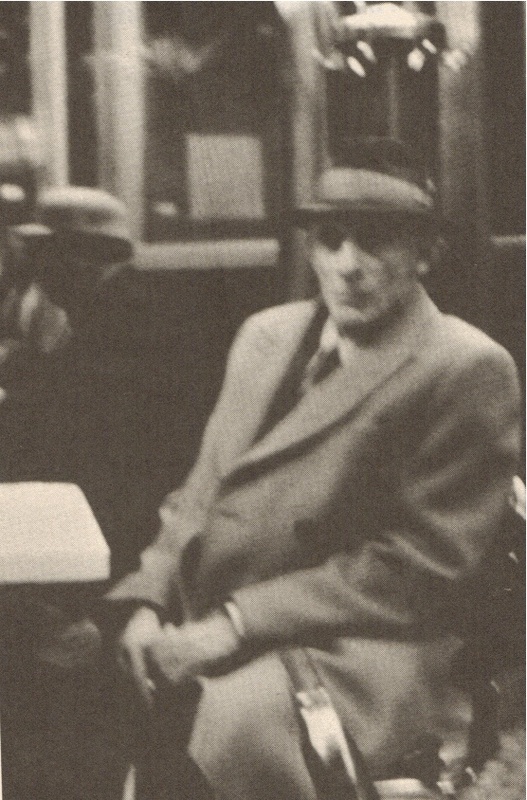 The photograph of Bart highlights Duneier’s keen sensitivity to the nuances of racial meaning as he asks the reader to consider the importance of scrutinizing the photographic image of white masculinity while challenging us to imagine the faces of black working class men through a seldom voiced public narrative of respectability. Though Slim exists as an autobiographical subject, I definitely conjured Charles Hite Sr., Thomas Greer, James Wilson, and the many black working class men who were their friends as I imagined Slim’s magnetism. For those without such names to call upon, Duneier destabilizes representations of those working class black men presented in mainstream culture and often drawn from sociological portraits whose photographs become shorthand for depravity, emotional immaturity, and sexual bravado. How did the opening photograph of Bart impact your reading? Was he familiar to you? Did it change your view of the look of a southern white racist? What about the absence of Slim’s photograph? How did you read this absence? I marveled at the willpower and self-control that Slim exhibited on a night when nobody seemed to have anything to say. After all, the whole circle could have gotten a lot of mileage out of that news. Despite his complicated feelings for the old man, he demonstrated a tremendous respect for Bart’s privacy. Slim’s perception of his own moral worth could not be separated from a disposition to act in accordance with standards appropriate to his associates, whose worthiness was taken for granted in that setting. A person of the weak moral constitution portrayed in major accounts of the black male would have preferred to let his friends know that he was on the inside. At Valois, Slim and his sitting buddies demonstrate an inner strength characterized by self-control and willpower that is seldom, if ever, attributed to the black male in social scientific and journalistic reports. Though black men are usually portrayed as so consumed with maintaining a cool pose that they are unable to ‘let their guard down and show affection,’ these black men had created a caring community in which one of the men, Leroy, had even expressed his feelings for Bart by telling him the men were interested in his illness because they loved him. These men were familiar to me. Were they to you? First of all, the fact that Gardner starts from the perspective that people begin with something marks a difference from the way that Americans have been prepared to imagine themselves. Here I’m thinking about a series of advertisements from the earliest days of the new century that featured professional basketball players who described themselves as “coming from nothing.” I have since heard this idea expressed when people want to draw attention to the challenges they have confronted on their journey towards material comfort. Gardner’s story about his mother, though, draws attention to what she was capable of despite the appearance of lack. As she says, “Boy, I’ve done so much, with so little for so long, that I can do anything with nothing.” The things she lacked did not stand in for who she was or what she had to offer. She did not tell them to clean up their lives or to go and sin no more. She did not tell them they were the blessed of the earth, its inheriting meek or its glorybound pure. She told them that the only grace they could have was the grace they could imagine. That if they could not see it, they would not have it. I like that Gardner never preaches to people about what they lack. Instead, he tells them that they are rich in resources. I also like that he doesn’t tell you what to do with those riches. So he doesn’t tell you to start a business or to invest in some mutual fund. He does not tell you whether it’s better to rent or to buy. His point, as I see it, is that we recognize that we are rich in a way that we had not previously recognized. He leaves it up to us to decide how we want to spend, save, or invest this currency. Embracing the notion that we have the ability to define value and meaning for ourselves in spite of how the culture presents these options is a much more worthwhile pursuit than claiming nothing. We think it’s cute that he thinks anyone in Georgia would buy this book, but if any Georgian does, I’m happy to double the royalties and buy a pack of gum for a charity of Michael Moore’s choice. These remarks reflect very poorly on the Governor’s office. Dismissing Moore’s claims that the state’s officials are “racists” and “killers” by smugly and falsely imagining a wholly conservative Georgian populace ignores a claim that requires a serious, thoughtful response from the state’s highest office. How do you seriously respond to the parole board’s decision to dismiss the 663,000 petitions for clemency? How does Robinson, as a mouthpiece for Deal, define a Georgian anyway? Does being a Davis supporter exclude a person from that identity? There is nothing “cute” about anything surrounding an execution. Robinson’s claim that he would “buy a pack of gum” for a charity of Moore’s choice along with doubling any royalties that would result if a Georgian purchased Moore’s book is equally troubling. How can Robinson justify his callousness in the face of constructing a person with real needs? One thing’s for sure: There are certainly “other models by which to live” and Brian Robinson does not provide a single one in his remarks that I would recommend. My husband and I used a few lines from Toni Morrison’s Pulitzer Prize winning novel Beloved on our reception invitation and we rendered them like this: “(S)he is a friend of my mind. (S)he gather me, man. The pieces I am, (s)he gather them and give them back to me in all the right order. It’s good, you know, when you got a (wo)man who is a friend of your mind.” In the novel, Paul D catches sight of a quilt and recalls Sixo thinking about the Thirty-Mile woman as he now contemplates his feelings for Sethe. In our rendering, my husband and I wanted the passage to mutually speak our feelings for one another. When I read this part of the novel now, I can still apprehend our earlier take on it as a passage about romantic love but I have become very interested in the passage, and the image of the quilt, as about more than the feeling of love but the work of it; to love–the verb. To that end, I’ve been thinking a great deal about my father. My father died from lung cancer on March 8, 2010. By the end, I think that my father had finally started seeing the pieces of himself and of his life coming together much like a quilt. He seemed better able to live independently and responsibly. He no longer needed drugs to make everyday life manageable, but that made having cancer extremely difficult. The persistent pain of his illness meant that he would need drugs to manage and he could not reconcile alleviating the pain in his lungs and in his head with needing drugs to alleviate the pain from his soul and his spirit. When my father started taking percocet, I knew that he did not have long to live. My father could be incredibly funny and incredibly cruel; incredibly thoughtful and incredibly negligent. Maybe that’s why I always saw my father as a shattered man. He was someone who I always thought of as working hard to manage the pieces of his life, if not of life itself. After my father passed, I became obsessed with Eugene O’Neill’s play The Iceman Cometh because, in part, being at my father’s funeral with so many people talking about my father’s dreams and their dreams and realizing dreams that it made me think of those people in Harry Hope’s bar. I wanted to sit with the play and think about America and her pipe dreams. I couldn’t realize my obsession though because I couldn’t concentrate as much as I needed to, but I’d like to now. shelter where he worked and had once been a resident. 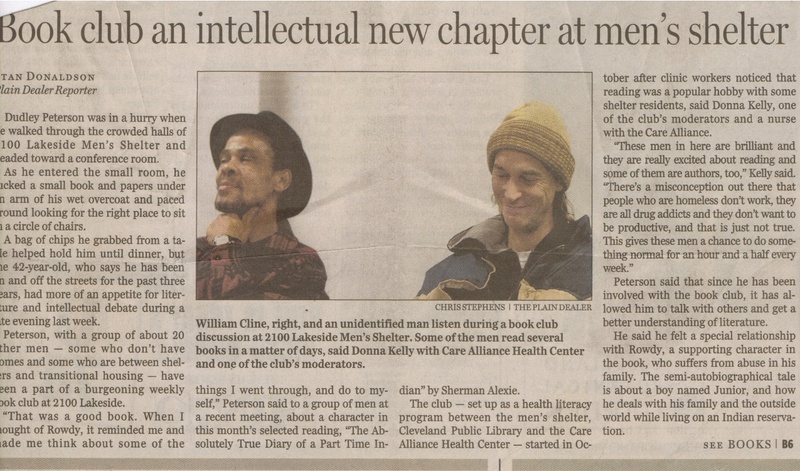 I happened to be in Cleveland when the article about the book club appeared in the Cleveland Plain Dealer. When we talked about it, he told me that he had told the reporter that while he was indeed a participant and did not mind being photographed, he did not want to be identified by name in the article or in the captions because he didn’t want to take the focus away from the other guys. While the article identifies Sherman Alexie’s The Absolutely True Diary of a Part Time Indian as the group’s selection, I don’t remember my father telling me that he had read this book. I would like to read this work as a part of my Reading with My Father series so that I can think through my father’s life and consider how this work might have impacted him, the men of his generation and the children they fathered. I am preparing to give a presentation about the Aunt Jemima icon. Chris Rutt and Charles Underwood sought to generate fond feelings for the self-rising pancake flour they developed through the figure of Aunt Jemima as she was characterized in a minstrel song. In order to cultivate enthusiasm for this early convenience food, they drew on post-Civil War nostalgia for an Old South where happy, well-fed black women cared for white families. In 1893, this portrait of an imagined South was enlivened when R.T. Davis hired Nancy Green, a black women who was formerly enslaved and had been working as a domestic for a Chicago judge, to portray Aunt Jemima during the Columbia Exposition in Chicago. For six-months, Green is said to have served more than a million pancakes while telling fabricated tales of Aunt Jemima’s life on Colonel Higbee’s Louisiana plantation. In 1925, The Quaker Oats company bought the Aunt Jemima trademark from The Davis Milling Company. Though Nancy Green died in 1923, the Quaker Oats company commissioned other black women to work in her place. Can you imagine? These women portrayed Aunt Jemima and in doing so dressed in red and white check gingham and wore bandanas on their heads and aprons over hooped skirts while making pancakes and singing songs at high schools, county fairs, and at women’s clubs throughout at least the early 1950s. She was sort of like Santa Clause, I guess. In conducting family research for her memoir, The Grace of Silence Michele Norris learned that her grandmother had worked as an Aunt Jemima avatar. If you get a chance to read her very thoughtful and moving work, I think you will find the “Aunt Jemima” chapter compelling. But if time prevents you from reading the book, hop on over to Norris’s blog where she records the thoughts of a woman who experienced “Pancake Day” at her elementary school with an Aunt Jemima avatar hosting the event: http://michele-norris.com/your-stories/rodney-knolton-innocence-lost-is-tragic/; it’s a gem! Anytime I have given this presentation, I am presented with stories about how families have either used or not used Aunt Jemima products. Most often what they say is that in place of Aunt Jemima, some families use Bisquick either to make a claim against Aunt Jemima or simply because it has become a family favorite. What I find so striking in these conversations is that no one ever suggests that they can make pancakes without the aid of a box mix. So in honor of “Models Monday,” I’d like to offer my own recipe for pancakes. Mix the vinegar into the milk and let stand for five minutes (this sours the milk thereby making buttermilk. You can also skip this step and just use 3/4 cup of milk). Whisk all of the dry ingredients together. Beat the egg and pour it, along with the vanilla, into the milk/vinegar mixture. Pour the wet ingredients into the dry ones and stir until combined. Cook as you would any box mix! Now, I like small pancakes, so I usually have leftovers. You can store your cooled pancakes in a plastic bag or in plastic wrap in the refrigerator. When you’re ready to eat them, you can put them into the toaster or the microwave. I prefer the toaster because they cook more evenly. If you want the convenience of a box mix, combine your dry ingredients ahead of time and store them in plastic bags in your pantry. Most people have the ingredients at home. But ultimately, when you make your own pancake mix, you are choosing “another model by which to live” and that’s much better than what is being presented to you in the marketplace…or as the story told on Facebook. Follow the embedded hyperlink here to view the speech and to read the transcript (the links are exceptional; especially the discussion of MOVE, which makes Nutter’s remarks even more ironic). The media discussions that followed Nutter’s speech reminded me of the discussions following then Senator Barack Obama’s father’s day speech in 2008. In short, these discussions raised the issue of black people speaking in public about concerns that may be expressed privately amongst black folk but not openly addressed in the presence of white folk. Though Nutter made accusations about issues of respectibility in a way that Obama does not, the issue of airing concerns that are usually only discussed in the black community was a discussion point in both the mainstream press and in the black press. Black scholars have consistently addressed the problems with referring to “the black community” as if we are a singular lot or even a singular community without differing views, ideas, tastes, interests, and commitments. Even so, the reference continues to be made but interestingly, only in one direction. I’m interested in the historical difference between generations of black people who call out black folk from those generations who also saw white folks as members of a distinct community. Not seeing white folk as a community means that talk of a black community limits a perception of similar problems occurring on the landscape in general. For instance, when James Craig Anderson was recently run down by two white teens representing a group who set out to attack any black person, no preponderant of any theory of racial community came forward to offer white parents of these teens the assistance of the Department of Human Services as Nutter did with Black parents. Likewise in 2006 when three white college students set nine churches on fire in Alabama, no one came forward to offer white men tips on how to parent their sons. Instead, when the pastor of one of the churches spoke about the crimes, one of which involved his church, he acknowledged being told that they were “promising students from good families.” No senator or mayor went to church after the shootings at Columbine High School in 1999 specifically to chastise the parents for what they allow their children to wear to school or for their failure to monitor them. his daughter in cheerleading. The PSAs for the Fatherhood Initiative offer a worthwhile model for discussions of effective fathering because they highlight the importance of being a responsible father without race baiting. I went to the grocery store today to get a few things for the chicken a la king I a plan to make for dinner when I was given a surprise: the woman in front of me paid for my groceries! I told her repeatedly that that wasn’t necessary but she insisted. She told me that someone had done that for her just days before and she had talked it over with a friend and they each decided to give the same gift to a stranger. When I returned home, I noticed the receipt. I remembered being behind this woman in the store and I noticed her buying cupcakes. She had a little boy in her rocket designed shopping cart just as I did, and our sons appeared to be about the same age. As she was selecting cupcakes with multi-colored balloon trinkets on top, her son was insisting on being given a donut, which reminded me to hide the ones I was buying from mine. Our paths crossed again in line as she begged my pardon as she reached for a hand sanitizing wipe. “No problem,” I said, as I explained that I was too busy counting the items in my cart to make sure that I wasn’t beyond the ten required for that line to notice her ostensible intrusion. To be human means to be vulnerable to misfortune and disaster. It means periodically to find oneself in need of help, comfort, distraction, or edification. Our condition is for the most part an affair of the everyday, not of the heroic, and our minimal ethical responsibility to our neighbor, according to Boccaccio’s humanism, consists not in showing him or her the way to redemption but in helping him or her get through the day. The stranger that paid for my groceries today gave me a receipt that actually records her heroism in helping me “get through the day.” And I thank her for it. A few days before Labor Day, I was curious about conversations that might be developing around music and work. I found a few sites that ranked songs about working. I recognized several of them by Bruce Springsteen and I certainly knew Sam Cooke’s “Chain Gang.” I thought Donna Summer’s song “She Works Hard for the Money” was a good one to include. I think it’s also interesting that on the album cover, Summer appears as a waitress and that the back cover features Onetta, the attendant from Chasen’s restaurant who inspired the song. The song that came to mind for me that wasn’t featured on any lists that I saw during my quick search was Eric B. and Rakim’s 1987 classic “Paid in Full.” In 2008, the song ranked #24 on VH1’s 100 greatest Hip Hop songs. Critics don’t see “Paid in Full” as a work song; instead, Rakim’s smooth, stoic delivery and investment in the written text alongside Eric B.’s soulful sampling rightfully command discussions. The content of the joint, though, moves me. Rakim captures the thoughts of the kid who escaped the fate of the pool players at the golden shovel. You know Gwendolyn Brooks’ poem: We real cool.We/ Left school. We/Lurk late. We/Strike straight. We/Sing sin. We/Thin gin. We/Jazz June. We/Die soon. But what if at least one of ’em doesn’t “die soon”? What if the cool boy aged to become a cool old man? What is the aging cool? What might it look like? Rakim, I think, gives us a glimpse. In “Paid in Full,” a boy who “used to be a stick-up kid,” has a new idea about what he can do. So he’s “Thinkin’ of a master plan,” that don’t involve pool hall crimes but he’s got a problem “‘cuz ain’t nuthin’ but sweat inside [his] hand;” he needs money. Instead of turning back to a life of crime, he decides that he might “search for a 9 to 5” ‘cuz he’s figured out that “righteous” ambition might help him maintain the fragile fortune he’s achieved. Rakim’s lyrics point to the possibilities and pride to be found in honest work. Work offers him hope; a chance at living. It reminds me of the choice that southern black women made immediately following the civil war to work as laundresses. Though this was the most physically demanding of domestic tasks, it enabled them to spend time in their own homes with their own families. Instead of placing emphasis on the arduousness of the labor, they placed it on the space where they could realize greater freedom. We really can choose what we make of work and what aspects of it we emphasize. The work that Rakim ultimately describes doing is intellectual, creative work. Growth in the popularity of rap music offered black kids coming of age in the ’80s a creative outlet and an alternative to whatever 9 to 5 work young black men without a formal education could find. At the same time, Rakim does highlight the fact that even if rapping did not fulfill its promise and the 9 to 5 gig was itself the alternative, it was a better one than an illegitimate gig. There is life in work even if it doesn’t feel like it when you’re there. Having a legitimate job at least means that you have a chance to grow old–and that’s a chance that some of those cool kids in Brooks’s poem never got. I have never liked the feeling of breathlessness. That may seem unremarkable, but I spent much of my younger years as a competitive athlete and there are few sports that don’t require physical exertion. So what I’m calling breathlessness, is commonly referred to as “being winded” in athletic circles. I find the expression imprecise and it masks the actual experience of being out of breath. It’s an extremely uncomfortable experience. I can almost trace my decline as a competitive runner in terms of my efforts to avoid the feeling of my lungs being on fire. Thus, I knew that I did not want to spend my life playing sports where the terms of participating persistently recall death and dying. For example, runners refer to the buildup of lactic acid in their legs as “rigging,” as in rigor mortis and most runners tend to “die” at the end of races. I didn’t like racing against the clock. Now I want to control my time and how I spend it. I chose a profession that I thought would allow me maximum control of my time. When I had jobs that required eight hour commitments, I was miserable. And just think, an eight hour work day is an improvement in labor conditions. 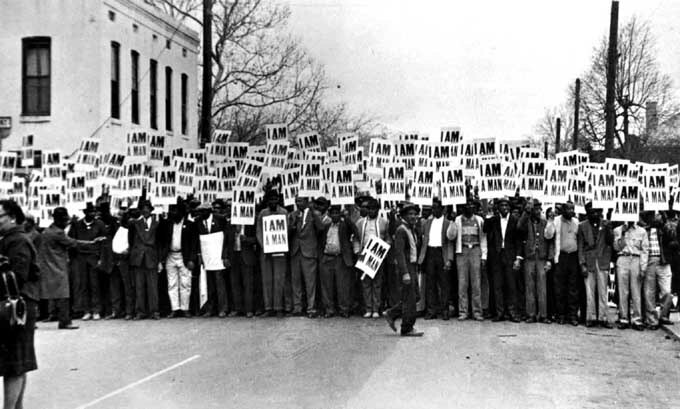 When 1,300 sanitation workers went on strike in Memphis in 1968, one of the things they were protesting against was their lack of control over their labor. When I first started to work, I started out in east Memphis. Our route was from Sumner, back across to Poplar, everything north of White Station. Depends on how much territory you had to cover. You had to cover that in a week. You had to stay out there as long as it would take you. You’d work ten, twelve hours a day. But you didn’t get paid but for eight. You stayed out there until you’d get through. We were out there sometimes ’til dark. You’d start at seven o’clock in the morning, no extra for overtime. Without overtime or even the guarantee of receiving full remuneration for an eight hour day, full-time workers for the sanitation department were still eligible for welfare. I came of age in the wake of the successes of union efforts but I was still well aware of how deadening blue collar work could be. Workers were not permitted very much creativity over their labor or their time. They were told what to do, how to do it, and when to do it. Nonetheless, these jobs provided families with adequate wages and healthcare benefits. If you missed Michael Moore’s film Roger & Me, I highly recommend it. The film documents the devastating impact of General Motors Chairman Roger Smith’s decision to downsize the workforce in the Flint, Michigan plant. It earns its spot among the top 50 documentaries you must see. I haven’t seen the film discussed much in terms of the current crises facing unions but it should be. Tying popular culture to actual experience might be the way to help people to identify with the challenges facing union workers.